Nazi-hunter Dr. Efraim Zuroff spoke with Arutz Sheva Sunday, expanding upon his Facebook remarks criticizing Israeli Prime Minister Binyamin Netanyahu's praise for Lithuania during his visit to the Baltic state. 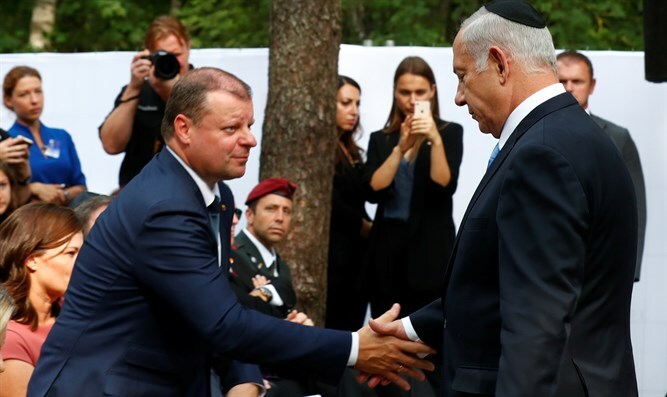 "He praised the Lithuanians for their efforts to commemorate the Holocaust, when in effect Lithuania is one of the countries that has done more than any other country to distort the history of the Holocaust. "[One of their goals] is to hide the role of the Lithuanians in the murders, and we have to state here a very important fact that only in Eastern Europe the collaboration with the Nazis included active participation in systematic mass murder. And in Lithuania, more than 20,000 Lithuanians were involved in the killing. There were less than a thousand Germans in Lithuania during the German occupation. All strata of Lithuanian society were actively involved in carrying out the mass murder of the Jews, and the results speak for themselves: Out of the 220,000 who lived in Lithuania under the Nazi occupation, 212,000 were murdered, in many cases by Lithuanians. "This is something the Lithuanians are trying to hide. They can't deny that the Holocaust took place, there are 227 mass Holocaust graves in Lithuania. But as far as they're concerned 'the Holocaust is when the Nazis came to our country and murdered our Jews'. If you press them they'll say 'Ah, there were a few degenerates; there were a few illiterate people who joined the Nazis and who carried out murders.' It's an absolutely terrible thing that Netanyahu spoke about them as if it were just the opposite. "The Lithuanian government has been very active in promoting the canard of equivalency between Communist and Nazi crimes. In other words they're trying to say that Communist crimes were just as bad as Nazi crimes, and that Communist crimes are actually genocide. Now if Communist crimes are genocide, that means that Jews committed genocide, because there were Jewish Communists who were involved in the measures taken by the Soviet Union and by Communist regimes against the peoples of Eastern Europe. So one second: If Jews committed genocide, how can Jews complain about the fact that the Lithuanians, the Latvians, the Estonians, the Ukrainians committed genocide? In other words if everyone is guilty, no-one is guilty."